Mikko Sams is a professor of Cognitive Neuroscience (Technology) at the Aalto University School of Science, in the Department of Neuroscience and Biomedical Engineering and Department of Computer Science, and the founder of the Brain and Mind Laboratory. His scientific career is extensive. 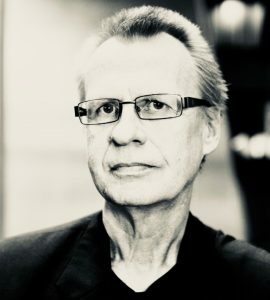 See https://research.aalto.fi/portal/mikko.sams.html His activities also include collaboration with musicians and artists. As an example, he organized with musician colleagues a concert in The Turku Music Festival 2010 (“Happiness”), and the same ensemble organized another concert in Turku Music Festival in 2011 (“Fear”). These concerts were continued in 2012 (“Jealousy”) and in 2013 (“Surprise”). His research group also participated in visualization of the performance of Rite of Spring in the opening concert of Turku Music Festival in 2011. An important theme in the science-art collaboration is understanding of human emotional and social behavior. In 2016 in Helsinki Festival, where Mikko with his colleagues held a concert on “Happiness”, and artistic activities are to be continued.